The only award of the Victoria Cross to a Canadian in World War I outside the European theatre stems from heroic action in the Middle East in May 1918. It happened during a vicious battle for the occupation of Jerusalem and the capture of Jericho from the Turks. 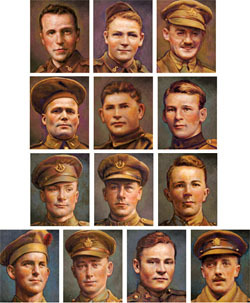 From left to right starting at top: Victoria Cross recipients Robert Edward Cruickshank; John Bernard Croak; Jean Brillant; Herman James Good; Harry Garnet Bedford Miner; Raphael Louis Zengel; Frederick George Coppins; Alexander Picton Brereton; James Edward Tait; Thomas Dinesen; Charles Smith Rutherford; Robert Spall and William Hew Clark-Kennedy. When Private Eddie Cruickshank’s platoon of the London Scottish came under heavy rife and machine-gun fire at close range while manoeuvring down a steep bank into a riverbed. Most of the men had been hit, including the unit’s commanding officer. The platoon sergeant, who immediately took charge, was killed shortly after sending a runner back to company headquarters for reinforcements. The lance-corporal who was left in command assumed that the messenger had been killed as well, and so he immediately asked for a volunteer to take back a message. Without hesitation, Cruickshank stepped forward. He pushed his way up the slope, but was hit by a bullet. After falling back into the wadi, he picked himself up and then rushed up the bank. He was struck again, and ended up rolling into a stream. After having his wounds dressed, Cruickshank made another attempt during which he was wounded a third time. After that, he was forced to lie all day exposed to enemy sniper fire until he could be moved under cover of darkness. At a hospital in Egypt it was discovered that Cruickshank had eight different wounds; three explosive bullets in his left leg, one in his left wrist, one in his left arm below the muscle, one in his right arm, one bullet in his right leg and another in his right thigh. Born in Winnipeg on June 17, 1888, Cruickshank was three when he moved with his family to northern London where he took his education. After joining the Royal Flying Corps in 1915 he transferred to the London Scottish with which he was wounded on the Somme. After recuperating, he sailed for the Middle East in January 1917. His postwar years were spent in Leicester where he died on Sept. 1, 1961. One of Canada’s greatest achievements during WW I began in France during a slight drizzle and fog at 4:50 a.m., Aug. 8, 1918, on a front 8,500 yards wide. By day’s end, the Canadians had advanced an unprecedented eight miles, capturing 8,500 prisoners, more than 160 guns and countless rounds of ammunition at a cost of fewer than 4,000 casualties. The start of what is often called Canada’s 100 Days included four acts of valour that resulted in VCs. Separated from his 13th Canadian Inf. Battalion platoon, Private John Croak encountered a German machine-gun nest that the pre-assault artillery barrage missed. Croak hurled some mills bombs at it and then attacked with bayonet. He silenced the nest and then took its crew prisoner. During the melee he was struck in the right arm by an enemy bullet. Nevertheless, Croak pressed on and caught up with his unit. When the platoon ran into another German stronghold consisting of three machine-guns, Croak charged forward on the double. Inspired by his example, the rest of the platoon followed him on foot with a combination of rifle fire and grenades. Again, using his bayonet, Croak attacked the nest and killed a number of its occupants. He also took prisoners. Croak, who was the first Newfoundlander to earn the VC, was born in Little Bay on May 18, 1892. He moved with his parents to Glace Bay, N.S., where he attended New Aberdeen and St. John’s schools before working as a coal miner. In 1915, he joined the 55th Bn., later transferring to the 13th Bn. For Corporal Herman Good, another member of the 13th Bn., Aug. 8, 1918, was a very busy day. His first feat was a solo effort at Hangard Wood where he attacked a nest of three German machine-guns. Several enemy soldiers were either killed or captured during the assault. Later on, while alone, he encountered a battery of 5.9-inch guns. Under point-blank fire, he and three other men from his unit attacked the battery. At face value, the idea of only four men attacking a battery seemed preposterous, but Good gambled that the enemy gunners would be untrained in hand-to-hand combat, the métier of the 13th Bn. But it was the element of surprise that so unnerved the enemy. In fact, the German crews surrendered without a shot being fired. The result was that the Canadians captured three heavy guns. For his determination, Good was awarded the VC. Born in South Bathurst, N.B., on Nov. 29, 1887, Good received his education at Big River School after which he went into the lumber business. He served with the 5th Bn., 2nd Pioneer Bn. and 13th Bn. He was wounded three times before the Battle for Amiens. After the war, Good returned to the Bathurst area where he engaged in farming and lumbering and served for 20 years as the district’s fish, game and fire warden. He died April 18, 1969, and is buried at St. Alban’s Cemetery. Shortly after the attack got started, Lieutenant Jean Brillant’s 22nd Bn. was held up by a German machine-gun at Meharicourt, France. With utter disregard for his own safety, Brillant raced forward and captured the gun, killing two of the gunners. Although he was wounded, he refused to relinquish his command. Organizing two of his platoons, he led a charge in which 150 Germans and 15 machine-guns were captured. Brillant, who accounted for 15 of the enemy, was wounded again. He subsequently attacked a nearby field gun that was firing directly at his men. Moments after racing ahead for 600 yards, he was wounded a third time. He continued on for another 200 yards before collapsing from exhaustion and lack of blood. Before losing consciousness, Brillant said to a subaltern in French: “I am through. Take charge of the company. I won’t be here long.” Brillant died two days later and is buried in the Villers-Bretonneux Military Cemetery in France. Born March 15, 1890, at Assametquaghan, Que., Brillant graduated from the St. Joseph University, N.B. He joined the 189th Bn. which later merged with the 22nd. On Aug. 8, during an attack by B Company of the 58th Cdn. Inf. Bn. at Demuin east of Amiens, France, Cpl. Harry Miner, though wounded in the head, face and shoulder, stalwartly refused to retire from battle. Instead, he led his platoon on an assault on the middle of the German outpost trench lines. Then, when a machine-gun held up the advance, he single-handedly attacked it, killing the crew and turning the weapon on the enemy. Later, with two others, Miner overwhelmed a German grenade post, bayonetting two of the garrison and putting the rest to flight. During the action, Miner was mortally wounded by a German stick grenade. For his courageous example, he was awarded the VC, the second time he had been decorated having earned the French Croix de Guerre in the fighting for Lens in 1917. He is buried in the Crouy British Cemetery, France. Harry Miner was born in Raleigh County near Cedar Springs, Ont. His VC was presented to his parents by the governor general, the Duke of Devonshire. On Aug. 9, a non-commissioned officer with the 5th Cdn. Inf. Bn., Raphael Louis Zengel, was leading his platoon in the advance east of Warvillers when relentless German machine-gun fire mowed down the troops on one of his flanks. This left a gaping hole in the line. Sergeant Zengel ran forward until he was approximately 200 yards ahead of his men. He overran the gun, killed an enemy gunner and the officer in charge, and then dispersed the rest of the crew. Later in the day, when the battalion was held down by heavy machine-gun fire, Zengel took charge directing the return fire with deadly precision. After being temporarily stunned by an exploding enemy shell, he pulled himself together and continued to direct the battalion’s fire against the Germans. His efforts, which helped bring the day’s action to a victorious conclusion, earned him the VC. Born Nov. 11, 1894, in Minnesota, Zengel moved to Manitoba at an early age. He worked on a farm and enlisted in 1914 with the 45th Inf. Bn. He later transferred to the 5th. After the war, he took up residence in Rocky Mountain House, Alta. He died Feb. 22, 1977, at the age of 82 in Errington, B.C. Also on Aug. 9, Alec Brereton’s 8th Cdn. Inf. Bn. platoon was caught in open country, exposed to a nest of German machine-guns with no way of finding cover. As man after man fell to enemy fire, the unit was in danger of being wiped out. Acting Corporal Brereton sprang forward alone and assaulted the nearest enemy post, shot the gunner and bayoneted another German trying to man the gun. His quick, startling action so unnerved the enemy that nine of them surrendered to him. Brereton earned the VC by single-handedly saving his unit from annihilation. Born Nov. 13, 1892, at Oak River, Man., Brereton worked on a farm in Alberta. After the war he acquired 640 acres of farmland at Elnora, Alta. He died June 11, 1976, at Golden Hills Lodge in Three Hills at age 83. Another member of the 8th Bn., Cpl. Fred Coppins was similarly trapped in open ground by German machine-gun fire on Aug. 9. His platoon could neither advance nor retire and there was no place to hide. He called for four volunteers and then led a charge in a hail of enemy bullets. All four volunteers were killed and Coppins was wounded. However, he managed to take out a gunner and three of the crew and then capture four other Germans. His quick, decisive action saved his platoon and earned him the VC. Coppins received his medal from King George V at Buckingham Palace on Oct. 24, 1918. Following the war he worked as a construction worker in Oakland, Calif. He died March 30, 1963. His funeral service was attended by representatives of The Royal Canadian Legion, the Last Post Fund and Canada’s consul general. Although the Canadian advance had been checked by intense enemy machine-gun fire, from Aug. 8-11, Lieut. James Tait was busy leading his 78th Bn. When a concealed German machine-gun began to cause heavy casualties, Tait seized a rifle and bayonet and then raced ahead. He killed the German gunner, and then his men rushed the position. The unit captured 12 machine-guns and took 20 prisoners. This action allowed the entire battalion to advance. Later, when the Germans counter-attacked under a heavy artillery barrage, Tait–although mortally wounded–continued to direct and encourage his men until he died. His decisive leadership and daring earned him the VC. Born May 27, 1886, in Dumfries, Scotland, Tait moved to Canada and was employed by a government survey company in the Kettle River District of the Northwest Territories. When war broke out he enlisted in the 78th Bn., and went overseas in time to participate in the Battle of Vimy Ridge. He is presumed to have been buried in Fouquescourt British Military Cemetery in France. A private with D Co. of the 42nd Cdn. Inf. Bn., Tom Dinesen was engaged at Parvillers, France, on Aug. 12. He charged the German lines no less than five times, putting a host of enemy machine-guns out of action and killing 12 Germans with bayonet, rifle and mills bombs. His heroism was conspicuous in the day’s fighting which resulted in the capture of a mile of strongly garrisoned and stubbornly defended enemy trenches. In addition to earning the VC, he was awarded the French Croix de Guerre. He later received the Order of Dennebrog. Born at Rungsted, Denmark, on Aug. 9, 1892, Dinesen enlisted in the Canadian Army recruiting office in New York City after having been turned down by the French, British and American armies. He moved to Kenya, Africa, after the war and became a farmer and civil engineer. He returned to Denmark in 1925 to pursue a literary career. Dinesen died March 10, 1970. On the night of April 12-13, Robert Spall’s platoon of the Princess Patricia’s Cdn. Light Inf. found itself cut off from the rest of the regiment at Parvillers and under heavy enemy fire. Sgt. Spall picked up a drum-fed Lewis gun, climbed the trench parapet and opened fire on the Germans from 200 yards, inflicting heavy casualties. He returned to his trench and when the Germans counter-attacked, he picked up another Lewis gun, jumped over the parapet and stopped the enemy assault. But this time a German bullet ended his life. Spall has no known grave, but his name is inscribed on the Vimy Memorial. Born March 5, 1890, in Suffolk County England, Spall came to Canada and when war broke out enlisted in the 90th Winnipeg Rifles. By mid-August 1918, the Amiens Front had become impassable and the Cdn. Corps was switched back to the Arras Front. The initial Canadian assault was launched Aug. 26 directly between the Scarpe River and the road running from Arras to Cambrai. In the vanguard of the attack on Aug. 26, 1918, Charles Rutherford, an officer of the 5th Cdn. Mounted Rifles, was well ahead of his troops during the advance on Monchy-le-Preux, France, when he stumbled into a party of armed German soldiers outside a machine-gun pillbox. Bluffing it out, he boldly stepped forward armed only with a revolver. When he demanded the enemy surrender, the Germans responded by opening fire on his men. Afraid they might return fire again, he took off his helmet and waved them to come on out, then ducked. All this left the Germans perplexed. Meanwhile, the Canadians charged, promptly capturing the gun and taking 30 prisoners. The unit then captured another machine-gun and took 30 more prisoners. Rutherford was awarded the VC for his “bold and gallant action”. Born on a farm in Colborne, Ont., on Jan. 9, 1892, Rutherford joined the Queens Own Rifles in 1916 and was posted to the 5th Bn. Before earning the VC he had already been awarded the Military Medal and the Military Cross. 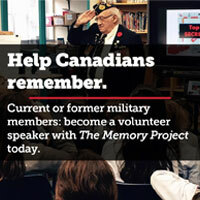 During WW II he served with the Veterans Guard of Canada. He was the last remaining Canadian WW I VC recipient before he died in Ottawa in 1989 at age 97. On the second day of the Arras Front offensive, Aug. 27, 1918, the commander of the 24th Bn., Lieutenant-Colonel William Clark-Kennedy–a Boer War veteran–led his battalion in the central position of the attack. As such, it became the focal point of German shelling and machine-gun fire. The battalion would have broken down completely if it were not for Clark-Kennedy’s example of personally leading assaults on enemy machine-gun nests and putting them out of action. By mid-afternoon, his unprecedented leadership and skill had so strengthened the line of advance that it enabled the brigade to reach the maze of trenches west of Cherisy, the village Cherisy itself, cross the Sensee River, and occupy the Occident trench in front of the barbed wire fences protecting the Fresnes-Rouvroy Line. Next day, Clark-Kennedy again demonstrated his leadership and gallantry in the attack on the Fresnes-Rouvroy Line and the Uptown Wood. Bleeding profusely and in intense pain from a badly wounded leg, he refused to be evacuated. Using a shell hole as his command post, he continued to direct his battalion. Realizing that further advance was impossible he established a firm defence line. After five hours he allowed stretcher-bearers to carry him to a dressing station to have his wounds tended to. For his gallantry he was awarded the VC to add to his other decorations, namely the DSO and Bar, the Order of St. Michael and St. George, the Croix de Guerre with Palm as well as four mentioned-in-dispatches. Born in Scotland on March 3, 1879, Clark-Kennedy graduated from St. Andrew’s College in Southborough, Kent, before going to work for the Scottish Life Insurance Company. When the Boer War broke out he served with the Imperial Yeomanry and Rhodesian Horse. After that conflict he went back in the insurance business and in 1903 was transferred to the Scottish Life’s Canadian office in Montreal. When war broke out he joined the 13th Bn., transferring later to the Victoria Rifles. After the war he returned to the insurance business in Montreal, and in 1940 was appointed honorary lieutenant-colonel of the 3rd Bn., Black Watch. He retired from business in 1945 and died Oct. 25, 1961, at age 81.